Train through an MCM menu, disable skill advancement temporarily or indefinitely, gain skill advancement from completing quests. Added option to spend skill points in the MCM. Added option to adjust current available skill points in the MCM. Message boxes now report your current skill level to help decide how to spend your skill points. Removed skill rate boost from trainers. Vilkas properly identified as a Two-Handed trainer instead of Heavy Armor. Edited descriptions of the Warrior, Mage, and Thief stones. Undoing skill changes before leaving the MCM will now be properly recognized. Tiny tweak to address one possible method of using the Oghma Infinium. 1. Adds an MCM menu that allows you to increase your skills. Why would you want this? Have you ever been sick of starting at level 1? Have you ever wanted to see what it would be like to play a level 60 character with no combat skills at all? Want to be a better smith without stomping all the way back Ghorza again? Just open your MCM and level yourself as you please. When you open the MCM menu you will see a list of all of your skills with sliders that go from the current skill level to 100. Now with uncapper support! Use the sliders to select the desired skill level. When you close the menu, your character will gain those skill levels as if they had accomplished them through normal use, including gaining appropriate levels and triggering any skill-dependent quests. 2. Adds a quest to keep track of trainers. I can never remember who's a trainer and who isn't. Whenever you meet a trainer, their name will be added to a quest so you can easily see their location on your map when you need some training later. This option is off until you turn it on in the MCM, for those of you who like to keep your quest journal clean. 3. Adds an option to disable skill increase through use. Turn off training to use your skills as much as you please without ever gaining a level. Put yourself in your difficulty sweet spot and never leave it. Gain skill levels only through training and book learnin'. 4. Adds an option to gain a skill-up upon completing quests, or when you complete any of several random tasks. An optional secondary means of increasing your skills. Completing certain tasks will give you "skill points," which you can spend after you sleep in order to increase skills. 5. Sleep and Standing Stone replacement. Warrior Stone: +10% effectiveness to all Warrior skills. Mage Stone: +10% effectiveness to all Mage skills. Thief Stone: +10% effectiveness to all Thief skills. Rested: +50% Magicka regeneration and +25 Carry Weight for 8 hours. Well Rested: +50% Magicka and Stamina regeneration and +50 Carry Weight for 8 hours. Lover's Comfort: +50% Magicka, Stamina, and Health regeneration and +100 Carry Weight for 8 hours. You can gain the stat bonuses, the training bonuses, or both. Configure in MCM. a. Skill rewards for completing non-Bethesda quests. 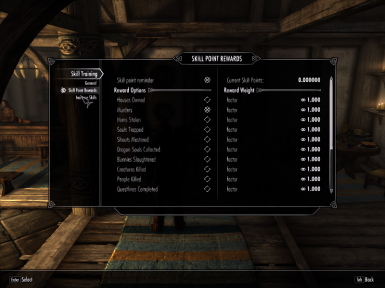 If a mod adds quests that boost your skills upon completion (similar to Amren's Family Sword or Noster's Lost Helmet), the reward not be detected. Bethesda quests will be properly detected. b. Non-Bethesda skill books read from the player's inventory. If a mod adds skill books directly to your inventory they will not be properly detected. Drop the book on the ground before reading it. Books found placed around the world will work properly from any mod. c. Any skill book read from a container inventory. If you read a skill book from a bookshelf, chest, knapsack, or other container the skill boost will not be detected. Take the book out of the container and read it from your own inventory, or better still drop it on the ground and read it from there. This also applies to the Oghma Infinium. 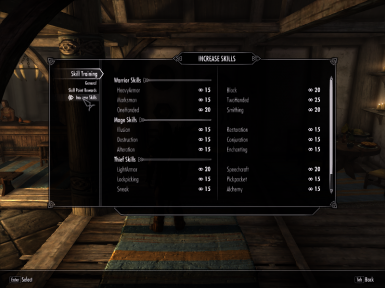 d. Scripted skill boosts from other mods. There's just no way to detect them. Of course you can use the included MCM menu to increase the appropriate skill if you feel that a skill-up was missed. i. Skill trainers from any mod. ii. Skill books found placed in the world from any mod (provided the mod author added the proper keywords). iii. 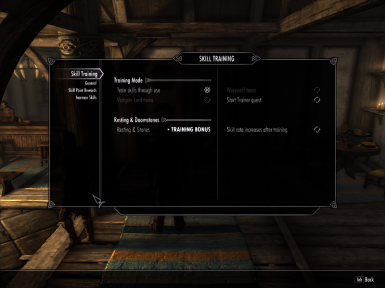 Bonuses to skillbook learning from any mod, including Dragonborn, provided the skillbooks are properly detected (activated in the world or vanilla books).